As a matter of fact, WordPress Multisite network is a technology that allows you to manage multiple WordPress sites from one control panel. It also enables you to update and install plugins and themes within a few clicks and manage a common database for all websites. You can use the WordPress Multisite network if your company has several departments and each department needs a separate website for the successful operation of the business. This technique helps you to save lots of money and energy used to run multiple websites. A Good Hosting with PHP support. Make sure that your hosting has enough resources (bandwidth) to support the Multisite network and sustain the burden of a large number of regular visitors. You must have at least the Basic knowledge of WordPress. If you are not acquainted with that, take the help of a WordPress development company in this regard. Before making any change to your website, it is always recommended that you should take its complete backup in advance. This is because unexpected happenings (human errors, hacking attempts, shortage of resources, deterioration of files, malware, etc) can take place when you implement changes in the live site. Always keep in mind that even the most reliable hosting providers don’t provide a reliable 100% protection to your website database. So, you must take website backup using WordPress Backup Plugins. Just store your important files on computers/laptops and cloud devices. This will help you to easily restore your website if something wrong happens all of a sudden. You have two options to add new sites on a WordPress multisite network- Domain or sub-directories. In case, you go for subdomains, just configure them on your server. If you select subdirectories, you will have to enable pretty permalinks on your root site. If you choose subdomains for websites on your multisite network, just go to your WordPress hosting account’s cPanel dashboard-Domains section- Subdomains. cPanel will trace the document root automatically and demonstrate it. Click on the ‘Create’ button to add your subdomain. 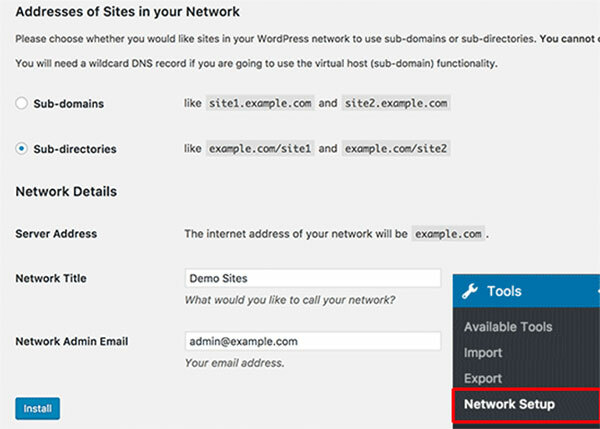 Now, you need to setup your network for WordPress multisite. For that, just deactivate all plugins on your website by going to Plugins > Installed Plugins > All plugins > Bulk Actions > Deactivate. Click the Apply button. Now, you need to advance towards Tools > Network Setup page so that you may configure your multisite network. You can see a notice on the network setup screen. You need to inform the WordPress what type of domain structure you would like to use for websites on your network-Subdomains or Sub-directories. Just choose a title for your network and use a correct email address to access the network admin area. Click on the install button to continue the process and configure your multisite network. Make necessary arrangements in the network configure setting as per your specific needs. If you don’t have a clear understanding of all these procedures, never hesitate to avail the assistance offered by a WordPress web Development company. Now, it’s time add new websites to your WordPress multisite. You can do this easily by clicking on Sites under My Sites » Network Admin menu in the admin toolbar. You should give the site’s address on the ‘Add New Site’ page. Also, add the site admin’s email address and give a site title. By now, your WordPress Multisite is ready for use. Just install necessary themes/plugins on new websites as per your needs and start running multiple WordPress websites from one backend. WordPress multisite is an extremely beneficial technique for all those entrepreneurs who want to run multiple websites with a low investment. By following the above-mentioned steps, they can easily install Multisite Network feature on their WordPress websites. A WordPress Development firm can also help you to start multiple websites from a single backend. Marie Thomas is a WordPress developer by profession and Writer by hobby. She works for Wordsuccor Ltd., that is one of the best PSD to WordPress conversion based company in USA. If you need to hire a WordPress developer you can contact them on Google+, Facebook, and Twitter.